When was the last time you evaluated the relationships in your life? One relationship we often forget is the relationship we have with exercise, in essence, the relationship we have with our well-being. Some of us neglect this relationship, or conversely, hyper-focus upon it. As a physical therapist, I often see the struggle it poses for people. How many of us double-down on exercise and weight loss goals starting at New Year’s, but now dread the idea of one more minute at the gym? Conversely, how many of us are fitness buffs who feel like the day is wasted unless you’ve hit the gym? Or maybe you fit in-between. You would rather sit and watch TV, but know if you want to feel comfortable in a bathing suit. Or to keep up with your family on vacation, you feel you should probably work out. Wherever you fall, knowing the benefits and shortcomings of exercise may help you better understand your role in the relationship. Everyone knows that exercise improves heart and lung function. It does this by improving blood flow, endurance, blood pressure, and blood sugar that can help prevent or manage chronic diseases such as diabetes, high blood pressure, or high cholesterol. This can lead to result in reduced medication dosage (as guided by your physician), as well as reduce risk of heart attack or stroke. This may seem like a no brainer, but you can’t deny the positives of increased strength on your daily life. This includes maintaining your ability to do yard work, lift your children/grandchildren, climbing stairs, or endurance with walking. It can even reduce risk of injuries like joint pain or a pulled back. Resisted strength training will improve density of your long bones and spine which can reduce risk of fracture or injury. Building bone health is not only important for older adults, but maintaining good bone health starts when you’re young. Not only does exercise improve blood flow to the body, it also improves blood flow to the brain. This allows the brain to receive needed oxygen and remove any waste products that may contribute to conditions like dementia and Alzheimer’s. Studies show that as little as two days of light intensity exercise a week can reduce cognitive decline. 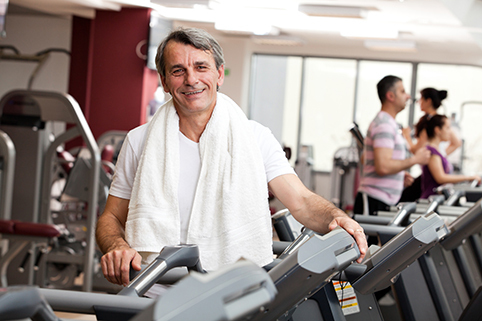 Exercise can positively affect mood by impacting hormone release. This includes increasing endorphins, the feel good hormone, in the brain. Endorphins work to naturally improve mood, reduce depression, and improve focus. Exercise also reduces the levels of cortisol, or the stress hormone, which contribute to feelings of anxiety. Arthritis is often associated with increased joint pain and can result in decreased participation in your daily activities. However if done with correct form, exercise can improve joint health and reduce your activity limiting pain. Consider consulting a professional like a personal train-er or physical therapist if exercise causes pain in your joints. This is often the biggest obstacle to maintaining an exercise routine. Our lives seem to be hectic already but starting small and gradually increasing can be the best choice for long term change. As little as ten minutes of exercise is better than nothing, and once it becomes a habit, surprisingly, the time will make itself available. The rule of thumb is muscle soreness should dissipate within 24-36 hours after a workout. If pain persists, it is a sign that the exercise was too intense. Or if pain is sharp or limits your daily activities, you may want to visit a health professional such as a doctor or physical therapist. Starting an exercise routine can be daunting for those who have never exercised before. It can be easy to be put off by the idea of working out in front of strangers or the uncertainty of how an exercise is performed. Luckily there are a plethora of resources that can instruct people of all fitness levels. This includes on site personal training at the local gym, YouTube, online fo-rums, or from a physical therapist. All the drawbacks listed above can weaken your commitment to an exercise routine. In order to resist these drawbacks consider exercising with a friend, set a goal to reach such as a 5K, join a sports league, or pick exercises that you’ll enjoy such as Zumba or swimming vs. walking. This year, I encourage you to re-kindle your relationship with exercise. Consider the barriers that are limiting your experience and decide what benefits are most important to you. Problem solve how you can overcome those barriers if it means joining a gym, working out with a friend, or just starting with 10 minutes of exercise. If you’re still at a loss, meet with a trusted professional such as a doctor, personal trainer, or physical therapist to find the best plan forward. I guarantee that if you give your relationship to exercise and well-being a little tender loving care you will find exciting, unique, or unexpected doors open in other aspects of your life.